Cubs outfielder Jimmy Sheckard celebrates his 30th birthday (Nov 23). Sheckard was one of the first players Frank Chance had acquired when he took over the Cubs in 1905/06. 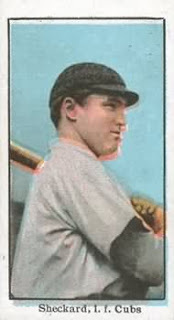 He gave up four players and $2000 (a high price) to Brooklyn to acquire him—but he knew that Brooklyn was mad at Sheckard for playing in the American League one season, and he knew that Sheckard was a great outfielder. Sheckard is more than a good ballplayer. He is a character. Thanks in large part to the writings of Ring Lardner, who is a beat reporter covering the Cubs, Sheckard becomes well-known for his horseplay with Solly Hofman and pitcher Lew Ritchie, with whom he forms three-quarters of a barbershop quartet (Jimmy sings baritone). One of Jimmy’s most memorable moments on the field also involves his trademark sense of humor. After Pittsburgh Pirate hitters spray the ball all around him, a frustrated Sheckard stops in the middle of left field, whirls several times, throws his glove up in the air, and goes to the spot where it lands. Orval Overall, pitching for the Cubs, can’t figure out why Sheckard is standing only a few feet from the left-field foul line and motions for him to reposition himself. Sheckard refuses. The next batter, Fred Clarke, hits a screaming line drive that goes straight into Sheckard’s glove. Jimmy tells his teammates that the scheme changed his luck in the field from that day forward. *Former gunslinger Bat Masterson turns 55, and is now working as a security guard for the U.S. Attorney in New York whenever a grand jury is in session. He was personally appointed to the job by Teddy Roosevelt. Imogene Fernandez de Coca is born on November 18th in Philadelphia. She will shorten her name and become one of the biggest stars during the early days of television. *Future bandleader Tommy Dorsey turns 3 (Nov 19) in Shenandoah Pennsylvania and future songwriter Hoagy Carmichael turns 9 (Nov 22). Carmichael will write “Georgia on my Mind” but he is from Indiana. *William Henry Pratt turns 21 (Nov 23) in England. Next year he will emigrate to Canada and adopt the stage name Boris Karloff. *Cubs pitcher Andy Coakley also celebrates his 26th birthday (Nov 21). He only played one month with the Cubs, but he did make three crucial starts during that month (September), winning 2 games, and finishing with an ERA of 0.89. With the Reds before he came to the Cubs on 9/2, he was 8-18, with a 1.86 ERA. He only has two more starts in his major league career, one next year with the Cubs (he gets rocked), and one in 1911 with the Highlanders (Yankees). He ends his career as a three time World Series champ (A’s in ’02 and ’05, and Cubs ’08), and is 20th on the Major League baseball all-time ERA list (2.35). Price check: A genuine Kit Carson saddle is $22.67. A Lincoln “Double Cinch” saddle, which is “perfect for farmers,” goes for $14.67. If you go back in time, and you want to take home your leftovers from a restaurant, they will think you are crazy. Refrigeration is in its infancy, you can’t wrap it up with cellophane (1912) or aluminum foil (1947), and the entire concept of the doggie bag won’t exist for another half century.